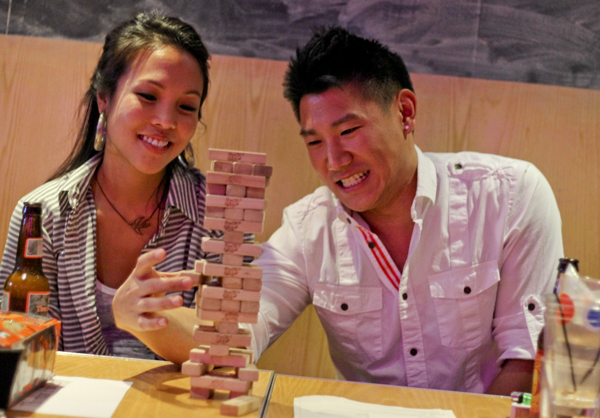 Patrons like Diana Jaw, left, and Mark Pak crowd Thomas Foolery to play games like Jenga, Cards Against Humanity and Mario Kart. “Angry Hour”: Get $1 off your drink from 5 to 7 p.m. if you order with an angry tone of voice. During the government shutdown, angry hour extends from 11 a.m. to 7 p.m. Instead of liquor bottles and beer taps, my eyes darted toward drawers full of candy and shelves stacked with Jenga, Break the Ice and Uno behind the bar at Thomas Foolery. The white room glowed blue as I made my way through throngs of people playing Mario Kart, Connect Four and Cards Against Humanity. Most of the few tables were occupied by wide-eyed adults lauding and criticizing their friends’ Connect Four moves. Every few minutes, a Jenga tower fell apart, followed by the unmistakable “aww” of a game lost. The P Street bar features cocktail kits for two comprised of mini alcohol bottles, a bottle of one of 15 specialty sodas, and treats such as Fruit Roll-Ups or Smarties. But never fear. People are still there to get drunk. And Thomas Foolery in Dupont Circle provides the perfect childlike buzz for your adult buzz. Beneath the bar, a refrigerator holds more than 40 different bottles of beer, priced in tiers ranging from $4 National Bohemians to a $9 Dogfish Head 90 Minute IPA. At the bar, I ordered my go-to bottle, Newcastle Brown Ale, which was reasonably priced at $5. My group scoped out a corner table as another group packed up their games. Swooping in after them, we found that this particular table is known as “The Throne,” requiring the one person seated to wear a sparkling, plastic, silver crown. A few tables down, one party committed a heinous gaming faux pas: occupying the Mario Kart table with the screen paused and unplayed. A grumpier patron would have demanded they play or leave, but in the interest of journalistic integrity, I merely observed. Instead, I cursed them under my breath and continued to encourage the aggressive (or reckless) Jenga game being played by the man sitting a table over. The competitive spirit of these simple games completely transformed the level of interaction. Here, it is common to dramatically cheer for random strangers playing children’s games. You don’t want to browse Twitter or text while there is a group of people you don’t know crowded around, emotionally invested in which block you are going to pull next. Jonathan Russo, right, looks on as Clark Nickell carefully extracts a Jenga block at Thomas Foolery on Friday. But back to the alcohol. 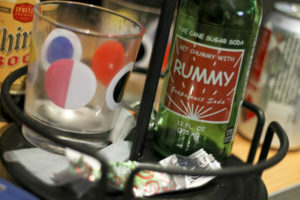 Liquor comes in single-serving bottles that can be ordered with any of the bar’s unique soda options, including Cooper’s Cave Chocolate Soda, Rummy Grapefruit and the first bottle of Bawls Energy this reporter has seen in years. Most drinks come with Fruit Roll-Ups, Sour Patch Kids or other candy at the bottom of the glass. A chalkboard menu lists the bar’s food options, including grilled cheese sandwiches and cookies. Listed on each beer entry is the person who chose it, among them teachers, local business owners and an astronaut. Anyone can select a beer to add to the menu, but only after making a purchase and playing hop-scotch every day for 30 days. This customer involvement is woven into the nature of Thomas Foolery. Hung on one wall is a series of pictures and baby photos of the 49 investors whose crowd-sourced funding paid to open the bar. The bar rules, framed on the wall by the entrance, offer fun ways to get discounts. To “Ice Someone,” you play Plinko to determine the price of a Smirnoff Ice to force upon an unsuspecting friend. “Dance Party” offers 10 percent off any item if you dress and dance like Carlton from “The Fresh Prince of Bel-Air.” If you visit during “Angry Hour” every day from 5 to 7 p.m., order in your “finest angry voice” for a dollar off. The bar staff contribute to this commitment for a good time. The friendly bartenders are quick to encourage shenanigans – the mere clank of my empty bottle on the bar quickly prompted a shout of, “Looks like someone needs another!” It was a welcome change from standing tip-toed over people’s shoulders trying to wave a bartender down with a handful of cash. The energetic, jovial vibe makes Thomas Foolery a perfect spot for a small party or outing. With all of the emphasis on fun and nostalgia, it’s a guaranteed good time for almost any or no occasion. Both your 10-year-old and 20-something selves will thank you.